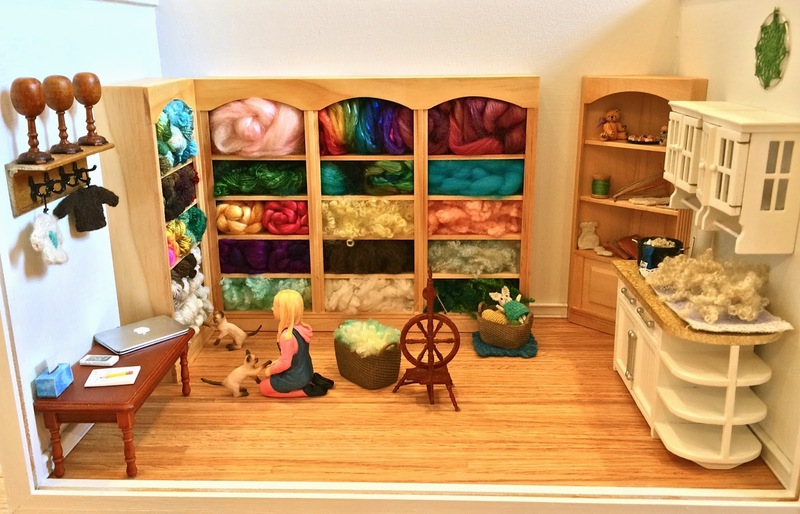 Stash Enhancement: Miniature Fiber Room - Maybe The Coolest Project I've Ever Done! 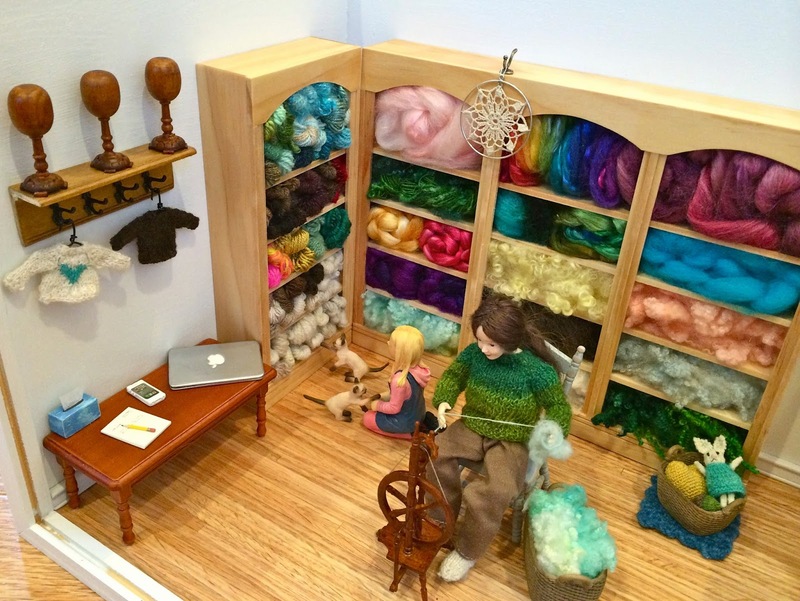 Miniature Fiber Room - Maybe The Coolest Project I've Ever Done! 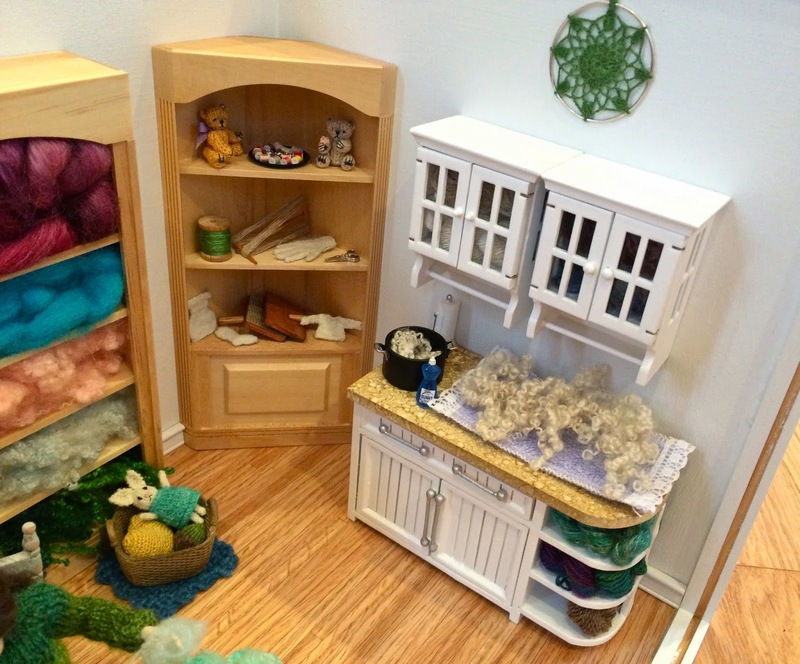 Other than the two teddy bears on the top shelf of the corner shelving unit, I made all the miniature garments and stuffed objects myself - meaning I processed the wool and/or silk, spun the thread and knit or crocheted the objects. 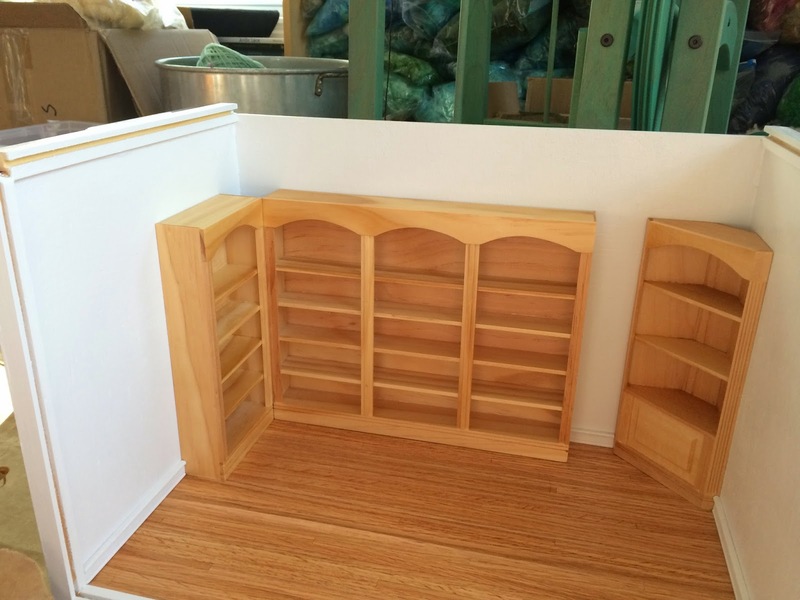 The fiber in the back shelving unit comes from various sources. I washed and dyed the fleeces. The rainbow is from Zebisis Designs. 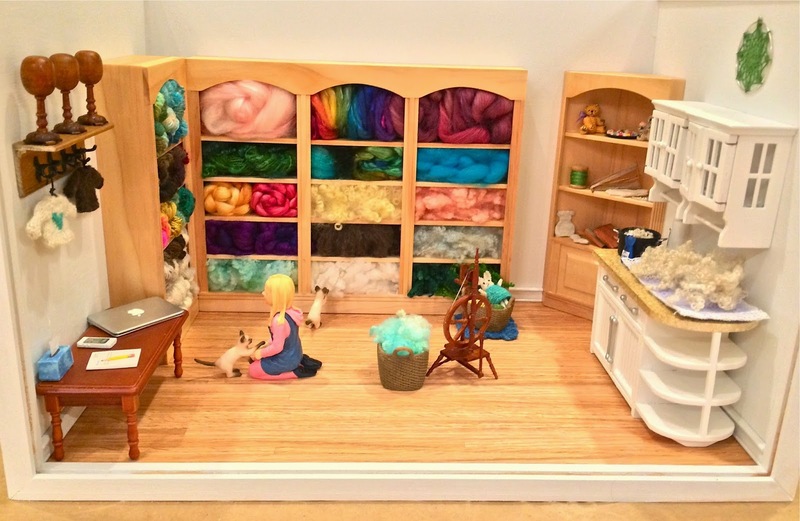 The fiber in the top right compartment is from Corgi Hill Farms, as is the fiber I've used to make the golden and hot pink rolled braids in the middle shelf of the left column. The purple on the shelf under that is from Zebisis Designs, too. 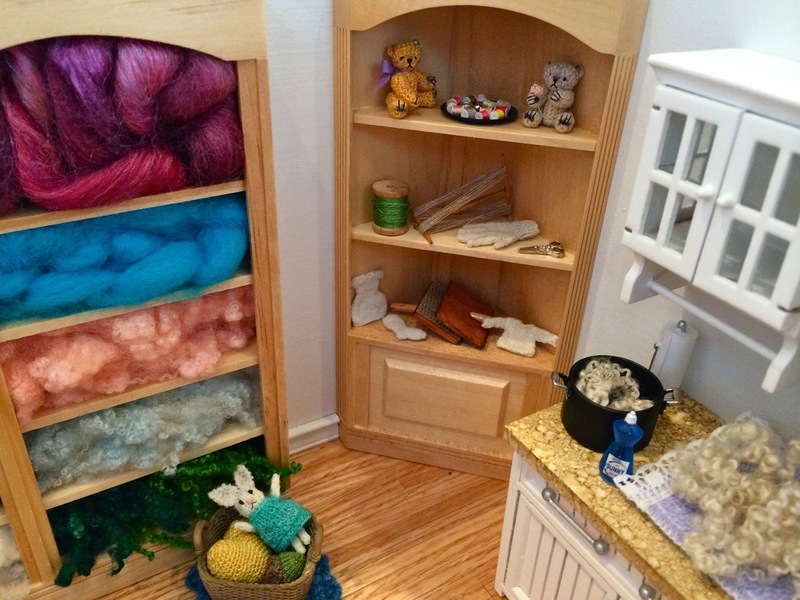 The yellow BFL fleece in the middle shelf of the middle column is from BohoKnitterChic Spins. All the rest was processed and dyed by me. 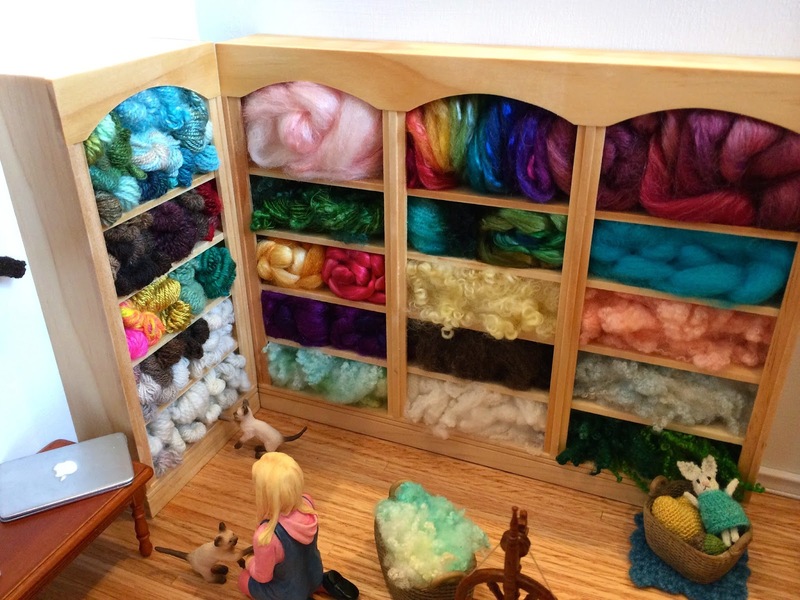 I spun all of the yarns in the yarn shelving unit except for the bright pink one, which was spun by my 10yo daughter. I knitted the sweaters that are hanging on the left. I crocheted or knitted the three objects in the basket on the floor (a puffed heart, a tiny acorn and a bunny in a dress), all from fibers that I processed, dyed and spun. I wove the rug under the basket on a small square loom from yarn spun by my dear old friend Sonja, from cormo dyed by my friend Maeghan. 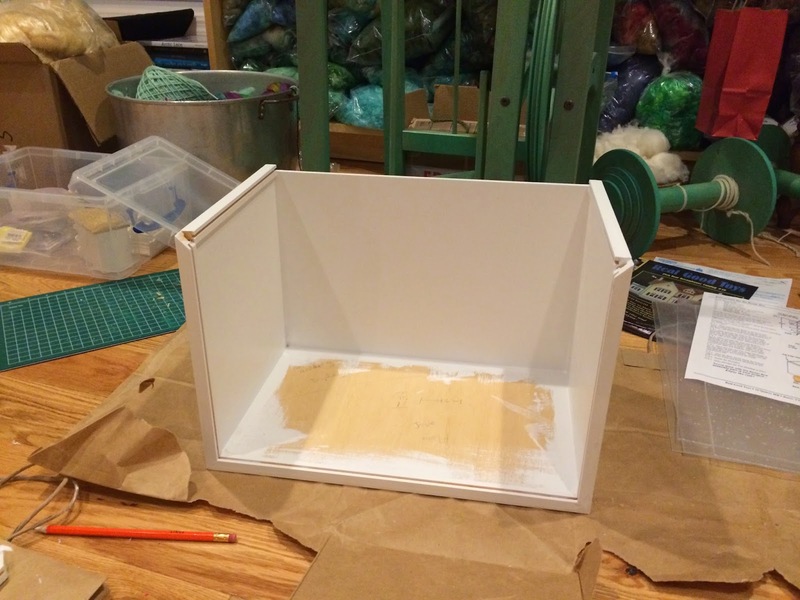 I love my fleece-washing station! It even has detergent. 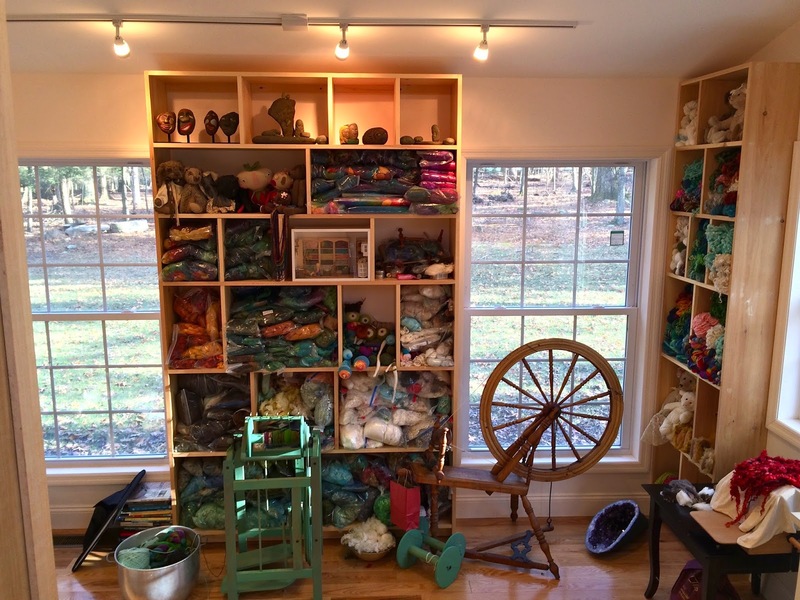 The corner shelving unit has thread, scissors, a niddy-noddy, hand cards, a full bobbin of handspun silk, and several tiny handspun, handknit garments. I crocheted the mandala on the wall above the cabinets from silk that I dyed and spun. I can't even express how proud I am of this. I love it, love it, love it!!! 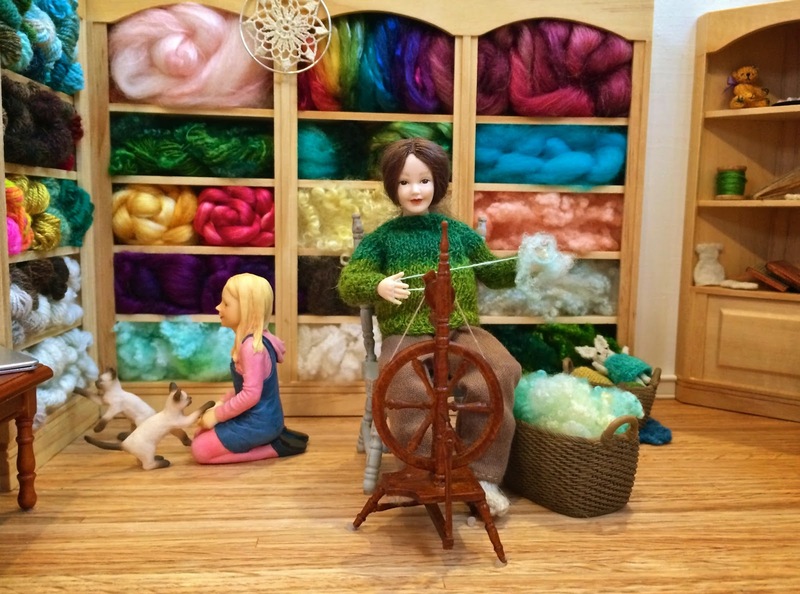 Can you see it in the midst of my life-size fiber room? UPDATE: I still don't have nice pants for the lady, but I have her in comfortable sweatpants for now. 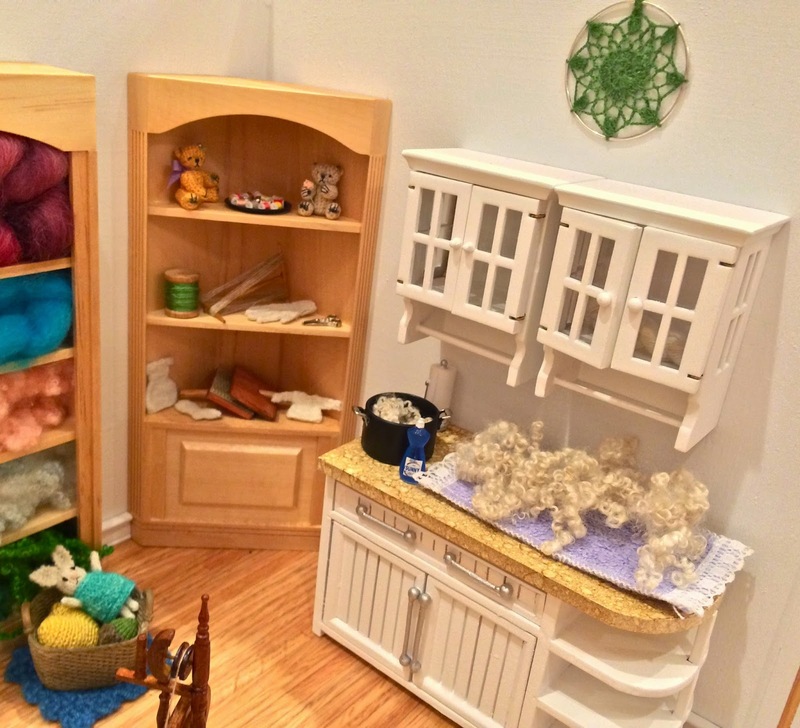 I added a crocheted (by me) mandala to the top of the fiber shelves, and I stocked the cabinets and counter shelves. 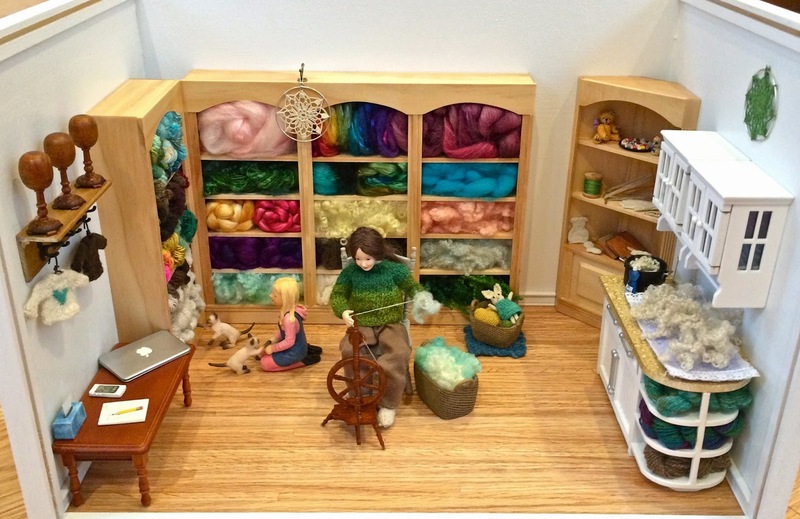 Fiber and miniatures - two of my favourite things. A perfect world. Great job and thank you for sharing. This is just a beautiful accomplishment to be so proud of. I think you have just about covered every tiny detail and know you will enjoy this for years to come, congratulations. Wow! 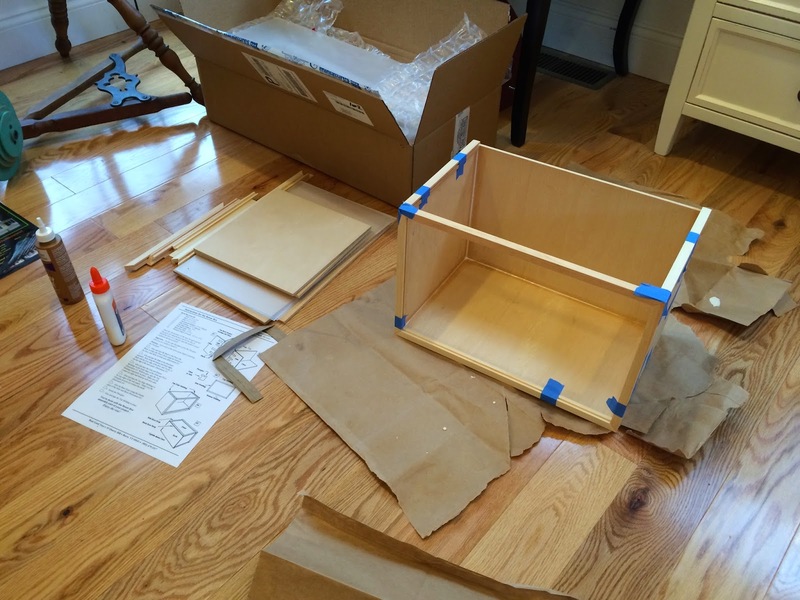 You did an awesome job especially with all of the extra items. You are amazing. 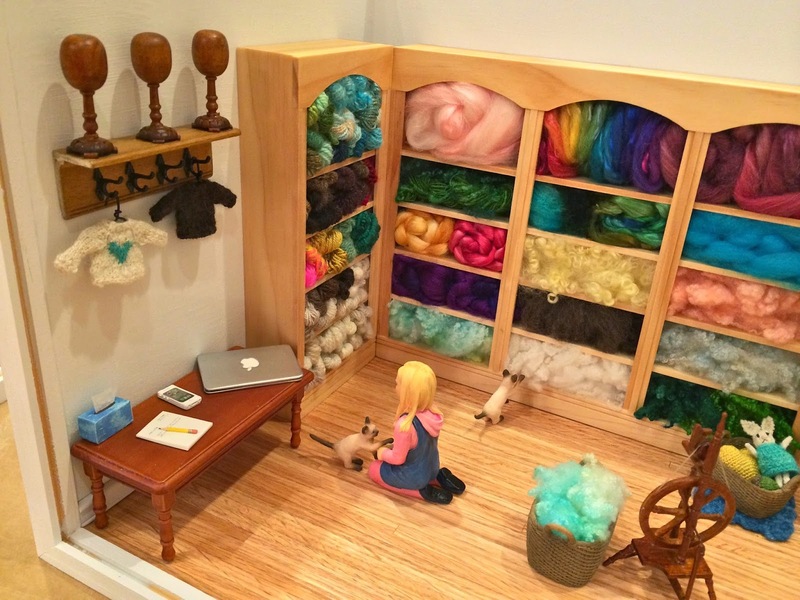 I would love to have a fiber room like that. This is astonishing, Jessie! You have every right to be proud. This is waaay better than a shadowbox! 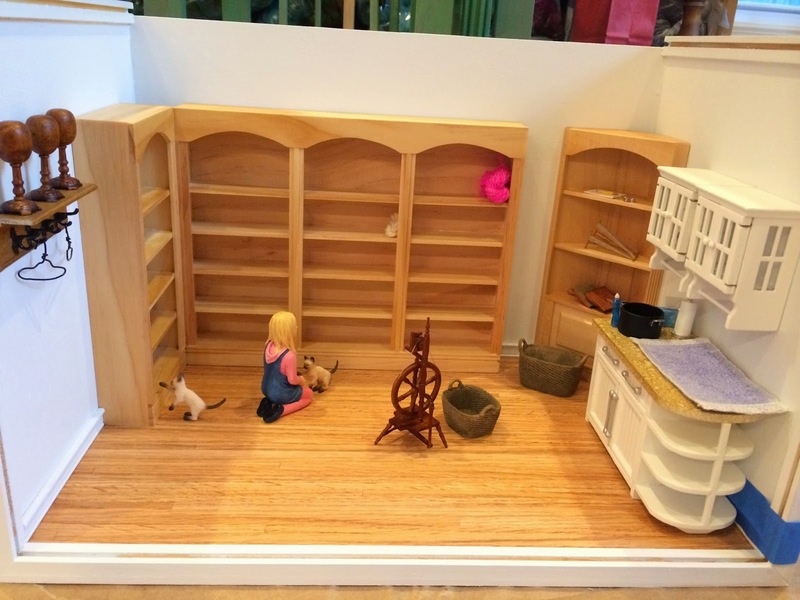 Remember when you were making these teensy things and just putting them in a bin? There is the little glove, the tiny sock, the itty-bitty sweaters... just brilliant. This is amazing! I love it. You really did a spectacular job.